Comet particularly likes going off on his own. 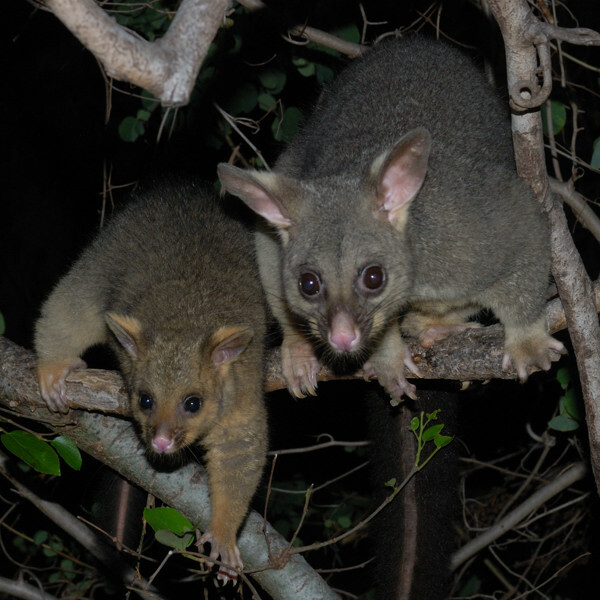 Normally, when a young possum of his age is with his/her mother, and scores a particularly delicious piece of food (usually by tearing it from the mother's mouth), they will retreat (no doubt to prevent the mother from grabbing it back) to perhaps a metre away from the mother to enjoy their treat. 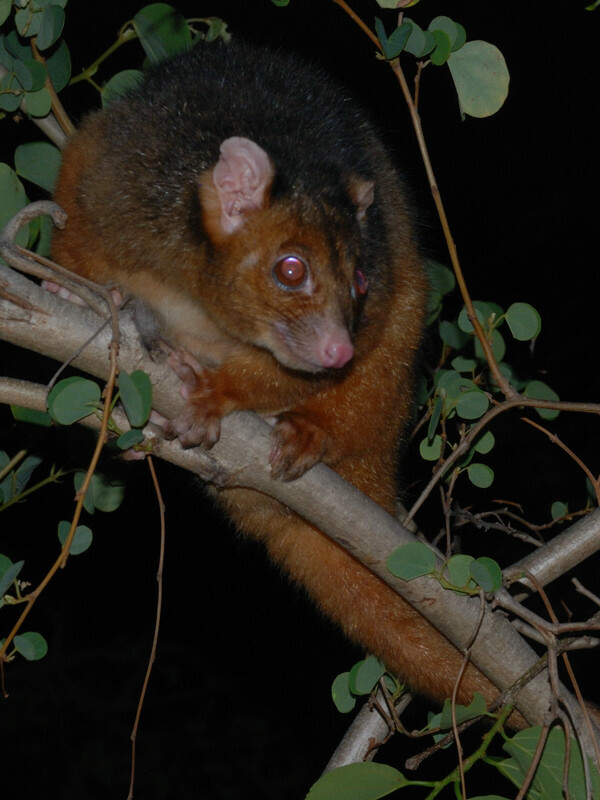 In Comet's case, however, he often runs off and hides in another tree five or more metres away. This is unusual; even Oz, who was a particularly adventurous/exploring possum, never did this. Wasabi is still visiting. His tail is somewhat improved but still not perfect. It was decided to treat him with Ivermectin anyway, since we have plenty of the stuff and it's fairly harmless. Shortly after this, an unusual thing happened: Tilda appeared on the hand-rail and appeared to be deliberately showing her tail (which had bald patches on it just like Wasabi) to the humans. It was as if she knew Wasabi had been treated and wanted some for herself. Although Tilda has been seen near the house frequently and doesn't seem to be afraid of humans, this is the first time she has deliberately approached us. Tilda subsequently accepted food by hand. She likes apples, but is not very interested in pears and refuses bananas - unlike Wasabi who enjoys all three and particularly likes bananas. Tilda appears to have babies in the pouch. They are still very young but large enough to be noticeable. It's possible that the young injured ringtail found about a month ago was hers, since her previous baby/babies would have been around this size. Ruby has been seen with a baby. This was the best photo I could get of the pair; they didn't want to come very close. It's possible that Ruby actually has two babies. 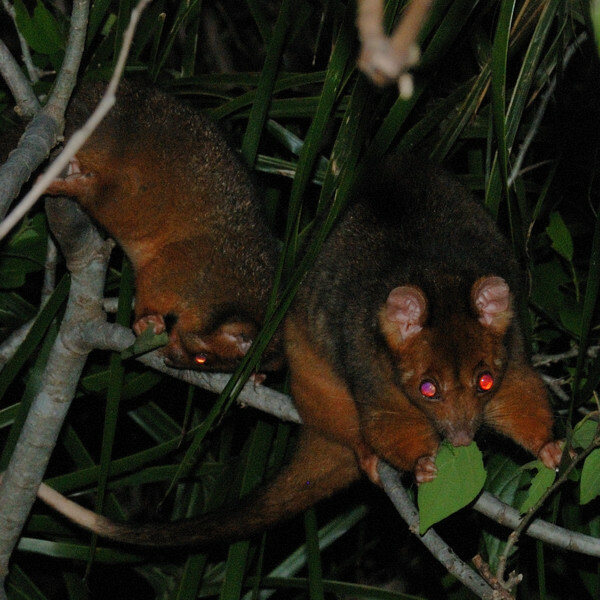 Tonight I think I saw a second baby with her, but it was difficult to tell for sure as they were in a distant tree and only the eyes of the third possum were visible. We've both had interesting weeks, possum behaviour wise :). 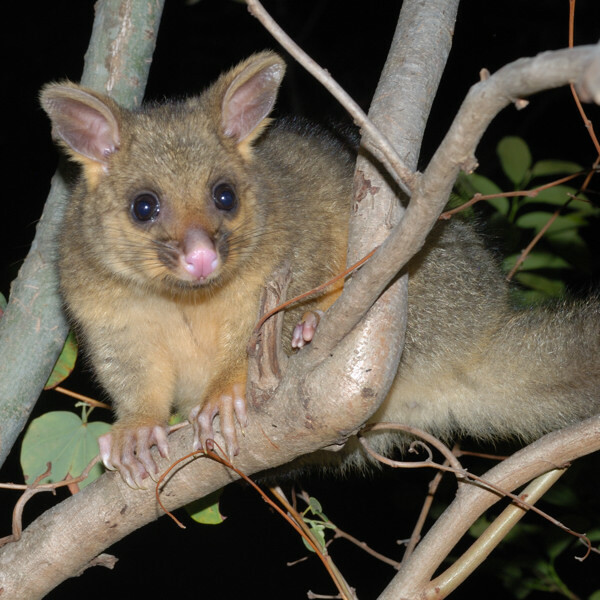 We agree, re possums coming to the house when injured or sick. It definitely happens.